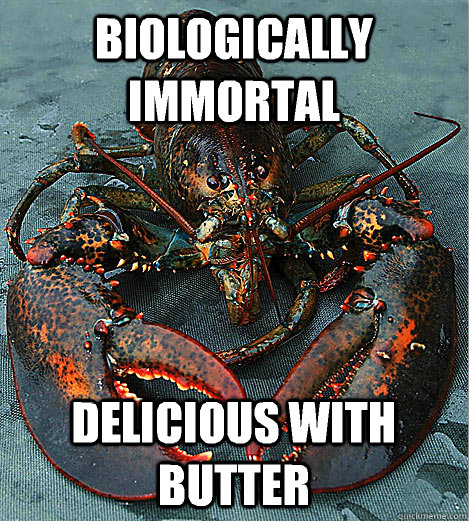 Lobsters are biologically immortal and don't die from age-related causes. This strange fact has been circulating the internet for at least the past five years. But is it true? Do lobsters have the capacity to live forever, if left undisturbed by hungry humans and other predators? Do they hold the key to immortality? Let's first see how the myth all started, before examining the scientific basis behind it. This viral scientific tidbit most probably started after a brief 2007 radio interview , in which Jelle Atema, Professor of Biology at the Boston University said that there is "no indication that this lobster is showing signs of old age", while talking about a lobster he keeps in his laboratory. The professor continues to explain that unlike humans who show clear signs of aging (e.g. 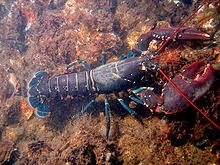 wrinkles, loss of muscle tissue, arthritis etc), lobsters show no "discernible signs of aging". They just get bigger and bigger by shedding their exoskeleton. What is implied by the interview, is that in a perfectly controlled environment, a lobster would simply never die from age-related causes. And by saying a perfect environment, we mean an environment with no predators, no parasites, plenty of food and so on. So, this is how the myth started to circulate. Is there any science behind the whole not-ageing thing? "Research suggests that lobsters may not slow down, weaken, or lose fertility with age, and that older lobsters may be more fertile than younger lobsters. This longevity may be due to telomerase, an enzyme that repairs long repetitive sections of DNA sequences at the ends of chromosomes, referred to as telomeres. Telomerase is expressed by most vertebrate during embryonic stages but is generally absent from adult stages of life. However, unlike most vertebrate, Lobsters express telomerase as adults through most tissue, which has been suggested to be related to their longevity." Although the above segment is properly referenced, it seems like the science behind it is weak, as pinpointed by the Neurodojo blog . In reality, there is very little, if any, proof that lobsters can grow indefinitely without dying of old age. Something to have in mind is that unlike humans, lobsters don't have a fixed maximum size. The more they age, the bigger they get. But let's hypothesize that lobsters really don't die from age-related causes. Would it be possible to get a godzilla-sized lobster after thousands and thousands of years of perfect care? Perhaps, a cow-sized lobster? Well.. probably not! Let's see some reasons why. First, according to Carl Wilson, lead lobster biologist with the Maine Department of Marine Resources , about 10 to 15 % of lobsters die naturally each year as they shed their exoskeletons. Wilson explains that after a point, the molting process is simply too much to take. It requires more and more energy and it is a natural part of the ageing process. Don't forget that Wilson doesn't talk for super old lobsters, but for individuals that are less than 50 years of age. "They run out of metabolic energy to molt, and their worn-and-torn shells contract bacterial infections that weaken them. Shell disease, in which bacteria seeps into lobster shells and forms scar tissue, adheres the crustaceans’ bodies to their shells. The lobster, attempting to molt, gets stuck and dies. The disease also makes lobsters susceptible to other ailments, and in extreme cases, the entire shell can rot, killing the animal inside." In theory, creating an environment free of bacterial infections is possible. So we can eliminate this problem. So, it's theoretically possible to sustain a lobster for thousands of years right? Even if they are truly immortal, the answer is again no. As aforementioned, the more our lobster ages, the bigger it will get. There will always be new physical limitations that will appear, due to the continuously increasing size of our (theoretical) lobsters. Perhaps the shell would become so big and hard that the lobster would be unable to break out of it during the next molting process. Or it would become so heavy, that the lobster wouldn't be able to move to feed itself or even crush under its own weight! The possibilities are endless, and as long as our theoretical lobster grows bigger and bigger, more and more life-threatening problems will appear due to its size. Problems that will need human intervention to ensure its survival. And certainly, a point will come, that our lobster won't be able to make the day without our help.I can hardly say that even in this far fetched scenario, we could consider a lobster that is continuously under life-support as..immortal! Just for the record, the largest ever caught specimen was collected in Nova Scotia in 1977. It had a weight of almost 20kg (~44lbs) and was 1m (~3.5ft) long.